Each year, on this fourth Sunday of Advent, the Church is invited to follow the footsteps Our Lady traced on that first Advent. In doing so, we’re doing more than just traversing the geographical route and historical events that preceded the birth of the Lord. We’re entering into Blessed Mother’s response of faith that acts as a guide for us along our own pilgrimage of faith. 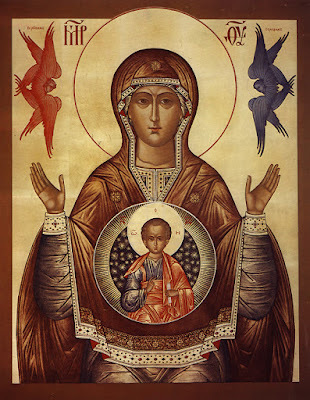 And so with the Lord, let us climb within Mary’s womb and listen to the beat of her contemplative heart that was treasuring within this greatest of all mysteries, so that our Christmas may be as fruitful as that first Christmas. This year, the sound of the heart beat is more intense because we are on the eve of the birth of Our Lord. In both the Year B and C cycles of our liturgical calendar, the Church invites us to contemplate the pre-Infancy narratives taken from the Gospel of Luke. The difference being, we consider the event of the Annunciation this year, and the event of the Visitation in the following. St Luke weaves some marvellous things into his Gospel that only a knowledgeable Jew would have understood—a Jew who knew Jewish Scripture and had eyes to see and ears to hear. One of the things he would have understood is typology. Now, in case you think this is some weird Catholic invention, the Bible demonstrates an awareness and usage of typology. In Romans 5:14 St. Paul tells us that Adam was a type of the one who was to come—Christ. Early Christians understood that the Old Testament was full of types that were fulfilled in the New Testament, thus St. Augustine wrote, “the Old Testament is the New concealed, but the New Testament is the Old revealed.” A type is a person, thing, or event in the Old Testament that foreshadows something in the New Testament. It is like a taste or a hint of something that will be fulfilled or realised. Types come alive in a new and exciting way when seen through the eyes of Christ’s revelation. Let us first consider the original Ark of the Covenant, before we consider its fulfilment and perfection in Mary. God loved His people and wanted to be close to them. He chose to do so in a very special way and so God instructed Moses to build a tabernacle. Within the tabernacle he was to place an ark made of acacia wood covered with gold inside and out, and within it was placed a golden jar holding the manna, Aaron’s rod that budded, and the stone tablets of the covenant. The Ark of the Covenant was, of all the sacred things in the Old Law, the most sacred—the one most holy thing, that answered, though very imperfectly, to the Sacramental Presence of Our Lord which was to be in the Catholic Church. It was shrouded from human gaze and was the centre of all devotion and worship in those olden times. But there is so much more. Notice the amazing parallels: In the ark was the law of God inscribed in stone; in Mary’s womb was the Word of God in flesh. In the ark was the urn of manna, the bread from heaven that kept God’s people alive in the wilderness; in Mary’s womb is the Bread of Life come down from heaven that brings eternal life. In the ark was the rod of Aaron, the proof of true priesthood; in Mary’s womb is the true priest. In the third century, St. Gregory the Wonder Worker said that Mary is truly an ark—"gold within and gold without, and she has received in her womb all the treasures of the sanctuary." On the eve of the day which the Church has chosen to commemorate the birth of Our Lord and Saviour, Jesus Christ, today’s reflexion is certainly no distraction, but rather an essential acknowledgement, that without Mary, there would be no Christmas. As with all Marian doctrine, a better understanding of Mary only serves to illuminate Christ Our Lord, because every grace she received and every role she held within salvation history is rooted in Christ. As we are reminded by St Louis Marie de Montfort, “we never give more honour to Jesus than when we honour His Mother, and we honour her simply and solely to honour Him all the more perfectly. We go to her only as a way leading to the goal we seek – Jesus, her Son.” Her role as the New Ark of the Covenant serves to reveal the true nature of Jesus Christ - one person with two natures: divine and human - and illuminate the purpose of the Incarnation within salvation history. The Old Testament is perfected by the New, and Mother Mary is the perfection of the old Ark of the Covenant.